I heard this from Wayne Dwyer at 3 am on a night when I had turned on the TV because sleep just wasn’t happening. Three simple words yet so powerful. For people struggling with IBS the words “ I am well” don’t often cross your mind. But they should. You see if you focus on “I am well” you take your attention off what is wrong with you. Because were so used to seeing what’s wrong with our body and trying to fix it. And no matter how hard we try we can’t control our body. But we can control what we think about it. Just saying “I am well “means that you are well in body mind and spirit. It doesn’t mean that your body is perfect without fault. So you do what you can for your body. You go to the doctor. You eat well. You exercise or do anything that makes you feel good and relax. Then you let your body be. You are not your body. You are experiencing your circumstances as who you are. You are not meant to be emotionally attached to what’s happening in your body but instead you should be focused on helping your body try to heal. When you focus on being well then you are at the core of being who you are. Then you can live your life regardless of what your body is doing. I have some tools in my e-book Listening to Your Gut: Connect With Your Body and Get IBS Relief that can help you do that and more. 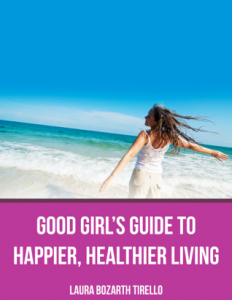 This entry was posted in Good Girls Health, News and tagged Crohn's disease, irritable bowel syndrome, Listen to your Gut, mind body connection, pain relief, Wayne Dyer. Bookmark the permalink. I really like this article. it seems so simple, yet we often forget it. thank you Laura for reminding us of this simple, easy yet effective tool!